The GMP SPA was founded in 1972 but is part of a group of companies which has been active in the stone industry for over 100 years. In the last century the activity was limited to the extraction of white Carrara marble, then the production of slabs of other Apuan marbles started. After 1950 the production and processing of some classic colored marbles began and finally after 1960 the plant in Dogana di Ortonovo was built where the production and distribution of both Italian and foreign granites began. Currently, the company has also offices and depots throughout Italy and subsidiaries in the United States. 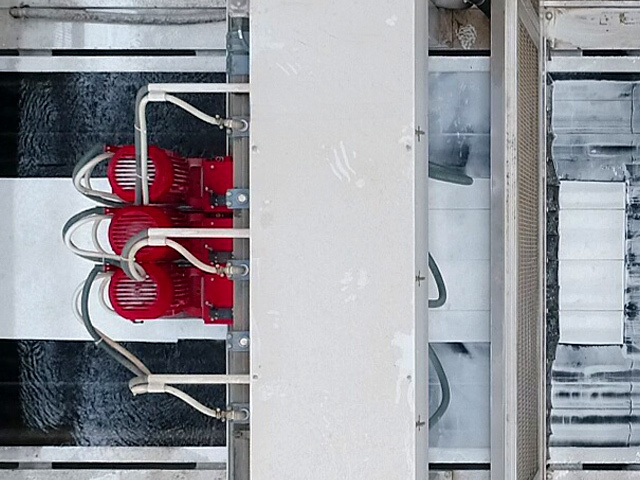 The concessions of GMP, the Fantiscritti and the Caldia® quarries ,situated in the most important marble basin of the world are where the precious Bianco Carrara, Bianco Venato, Bardiglio Nuvolato, Calacatta Caldia®, Statuario Caldia® are extracted. The GMP also extracts, buys and works granite and marble from all over the world ensuring, through exclusive contracts with producers the availability of a wide range of high quality products at competitive prices. 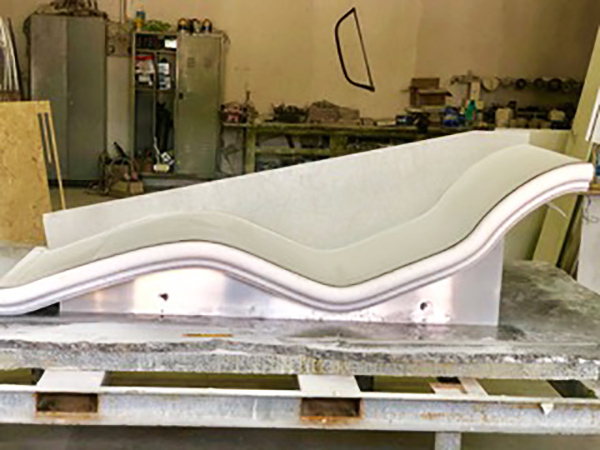 The GMP production is split between blocks, slabs and cut-to-size both for internal and external use. Thanks to the wide selection of products and large stocks of material in its depots GMP is able to satisfy all customers’ demands in terms of quality and quantity. A young and dynamic sales network projects the GMP in a worldwide market. Italy: the main factory and the five branches assure us a widespread coverage of the country. 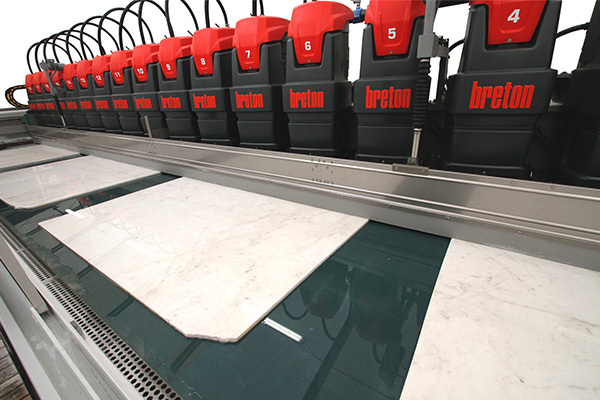 Recently, the company has dedicated a whole production area to a new Breton polishing marble slab line. SIAC was looking for a slab polishing line that could meet its expectations in terms of production efficiency and improvement of quality standards, and found the best solution in Breton’s “Luxmaster KFT 5000”. 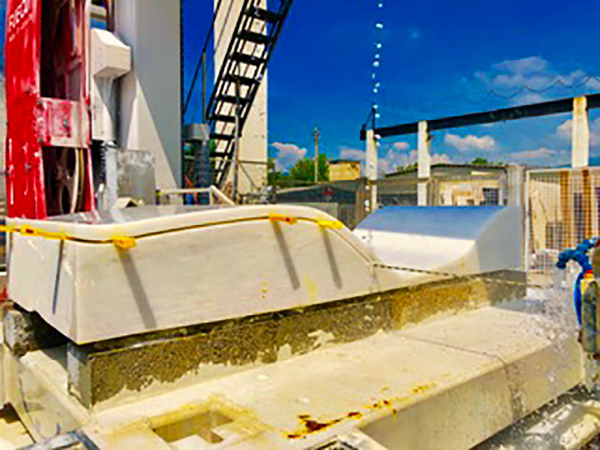 “Our Breton plant consists of: a loading slab Jot, a Luxmaster KFT 5000 polishing machine with 18 spindles, an automatic waxing machine, an automatic applicator of the protective polyethylene sheet and an unloading slab jot. A satisfaction for SIAC that can also be measured by the post-sales service guaranteed by Breton. “During the first months of regular production, several times we had to rely on Breton assistance several times to solve some hitches while testing. Online assistance personnel, like technicians/installers, have shown themselves to be punctual, professional and determined to solve our problems in every situation”. In fact, Breton guarantees a hotline service that is active 24 hours a day, thanks to the company sites in the United States, China, India, Australia and Brazil: a telephone service provided by highly specialized technicians, who are also able to carry out technical work directly on the machine installed at the customer plant, without the need for the operator’s presence. 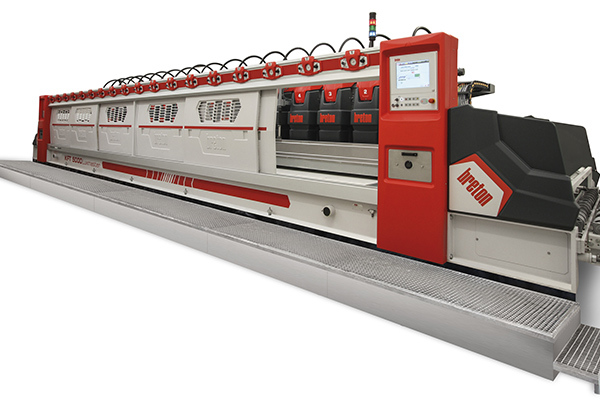 For more information and prices, on the Luxmaster KFT 5000, contact mail@breton.it. Thank you for the attention and best regards. The history of Savoia Marmi began 40 years ago. 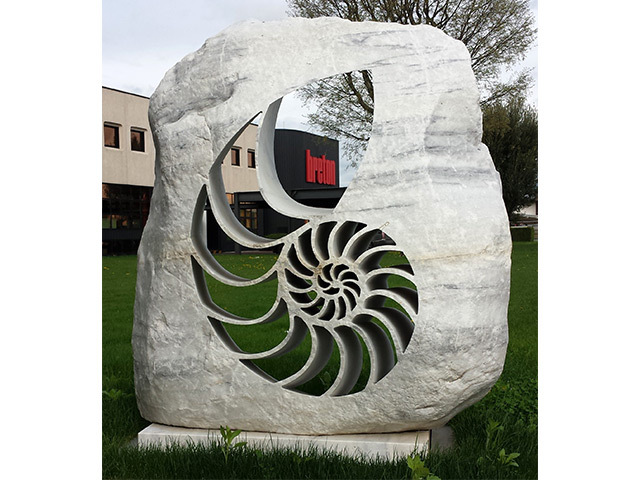 The proverbial quality of Savoia Marmi, is the result of thoughtful investments that led the company from a "simple" workshop to a proper natural stone working center: in this way, the company could fit in with an even more frenzied market, though maintaining its know-how. 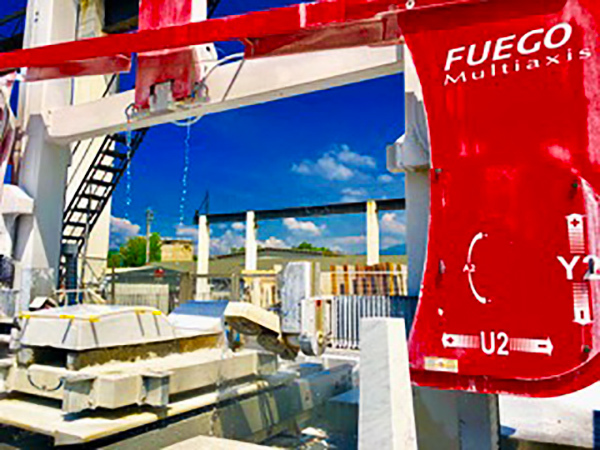 In June 2017, the high-tech stone machinery range of Savoia Marmi was extended thanks to the purchase of a Fuego Multiaxis, a perfect representation of what Breton brand means. Fuego Multiaxis is the ideal machine to realize cylindrical/conical columns, column shells and other complex items that were not available until now. Our machine is characterized by the overall dimension of the realizable pieces and by the technology used to build it: 30 years of Breton experience summed up in the realization of a revolutionary machine. 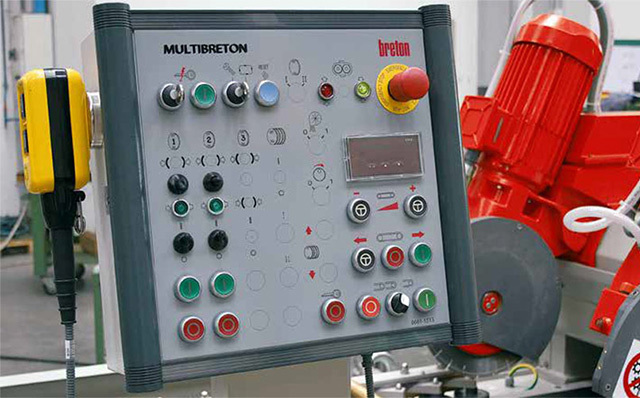 The technical solutions adopted for Breton Fuego Multiaxis made it possible to fix the main issue of this type of machine: the inclination of the diamond wire. 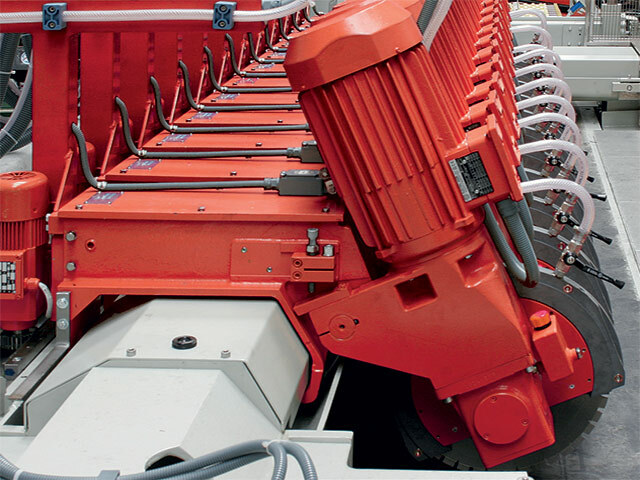 To obtain wide cutting angles, the machine should operate under the ground level. Breton has been able to fix this problem by mounting a cart with two Ø 1000 mm pulleys on every column of the Fuego and letting the two carts move independently. Breton Fuego Multiaxis deals with 4-axis operations with great ease and precision thanks to its 8 interpolated axes, which can be integrated by 2 more axes with motorized positioning. A simple and performing machine: these are Fuego main features, and the reason why it has been chosen by our prestigious costumer Savoia Marmi. 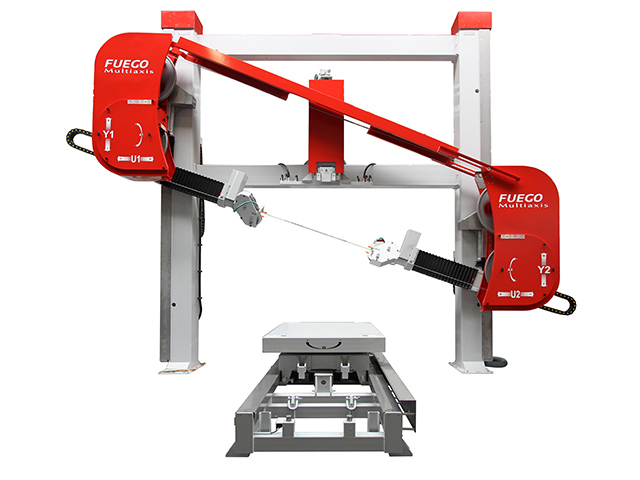 No more tanks aside the columns: this system, conceived by Breton, allows Fuego to work with a +/- 20° inclined wire and to process blocks with maximum height of 1800 mm; while, in case of a wire which is parallel to the block supporting platform, Fuego can process blocks as high as 2200 mm. 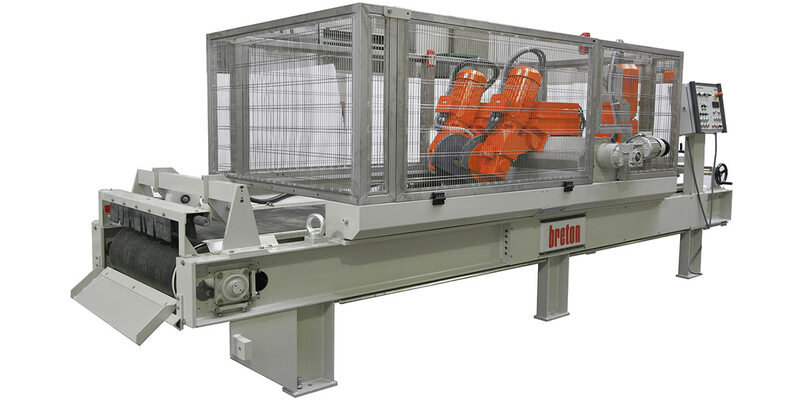 For more information and prices, on the Breton Fuego Multiaxis, contact mail@breton.it. We’ll get back to you promptly. 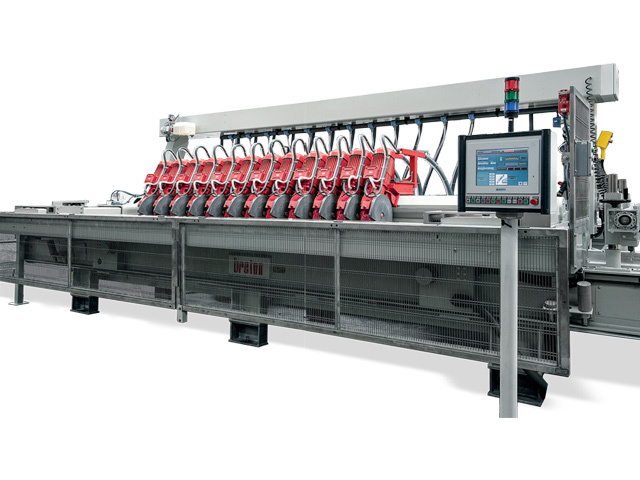 The Multibreton RC is a trimming machine for marble or granite strips that can be equipped with up to three cutting spindles: two spindles are adjustable in width while the central one is fixed. Strips are conveyed by a multiply belt covered by a thick layer of rubber designed to accept the cuts from the diamond blades. The two adjustable cutting spindles can be manually positioned along the bridge through a screw/lead nut system and slide on guides encased in an oil bath and protected by a water labyrinth seal. On request, operating from the push-button panel the positioning of each individual spindle can be motorized and sequential. When spindles arrive to the programmed position, hydraulic clamps lock them firmly in place on the bridge. 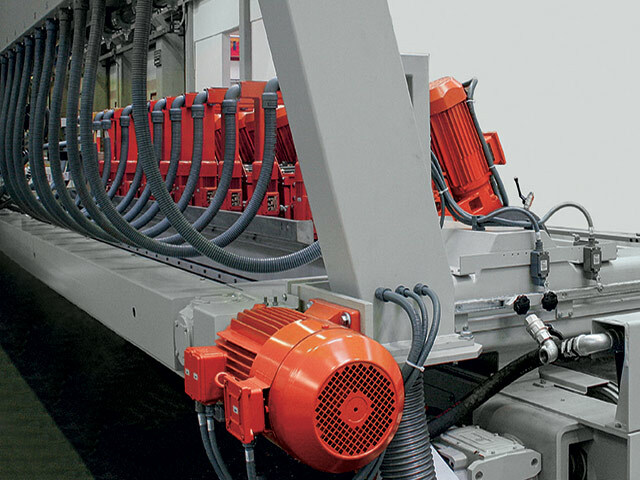 All cutting spindles can be independently excluded in height by means of a pneumatic piston. The smooth and straight advancement of strips over the conveyor belt is assured by a system of vertical and horizontal pressor rollers and by a horizontal guide made of wear-resistant steel. When the width of strips changes, the adjustment of both the guide and the vertical pressor system is self-centering and is obtained by simply turning a handwheels. All the general controls to start and switch-off the machine are located in front of the operator.A small portable push-button panel is available for the blade positioning operations so that the operator can safely command the spindle displacement inside the working area. When supplied to countries where such rules must be observed, the machine is supplied complete with the suitable accident-prevention barriers conforming to CE regulations. For more information and prices, on the Multibreton RC, contact mail@breton.it. MULTIBRETON DXL is an automatic cross-cut saw for marble or granite strips, equipped with up to twelve cutting spindles. 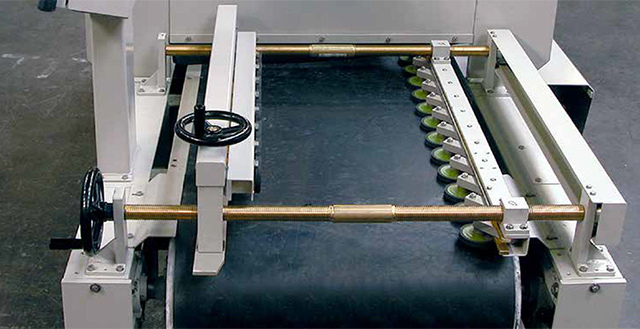 For each cutting cycle, the machine can saw a single strip or two strips simultaneously - even of different length - into items of the desired size. The cast-iron spindles slide along the bridge on guides in an oil bath, perfectly protected from water. 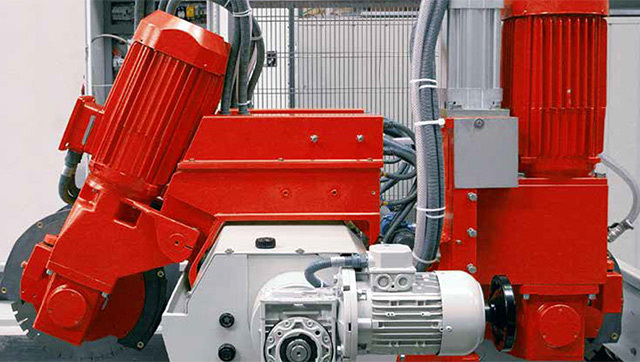 The spindle ositioning is automated, motorized by a screw with lead nuts connected to an electromagnetic clutch and adjusted sequentially for each single spindle. Once each spindle has reached the programmed position, it is blocked by a hydraulic mechanism. A pneumatic device can exclude each spindle vertically. On request, the machine can be supplied in a special version with simultaneous positioning of all the spindles instead of sequential adjustment of each individual spindle. 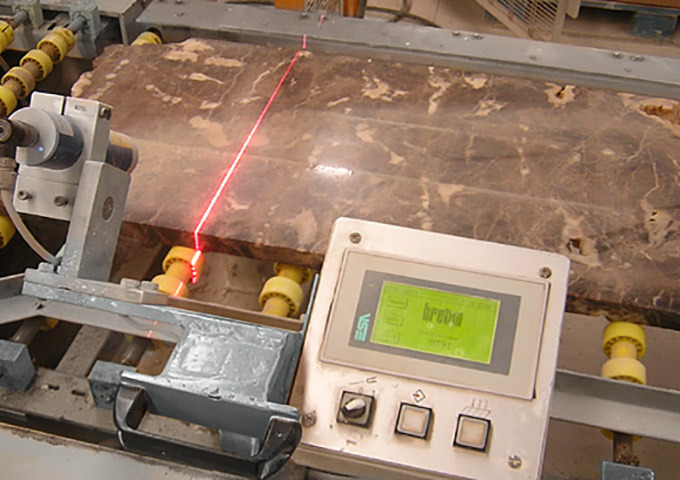 1. the marble or granite strip to be cut moves forward while resting on the feeding belt which slides on the milled bench of the machine, and halts close to the pneumatic stop (if existing). 2. a movable aligner to bring the strip into square before starting the cut, is housed on the front part of the machine, opposite the spindle-holding beam. 3. the cut is performed while the spindleholding beam moves orthogonally with respect to the conveyor belt. Once the cut is carried out, the saw blades lift before getting back to their starting position, and the strip - cut into tiles - is transferred outside the machine, while a new strip to be cut enters the machine. The machine is prearranged to cut also two strips of different length (max. 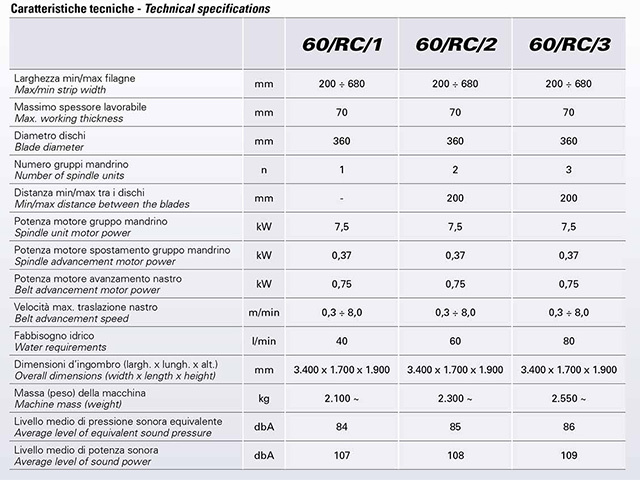 length: 1.500 mm each) through a single cutting cycle, thus optimizing the cuts. In this case, during the feeding stage, the first strip halts close to the stop on the machine exit, while the second one is placed at a precalculated distance from the rear edge of the first strip. A PC with Windows operating system controls the machine. The programming is carried out on a colour “touch-screen” monitor, which is installed on a hanging console. The machine software uses the Windows environment to its full potential through a user-friendly interface. 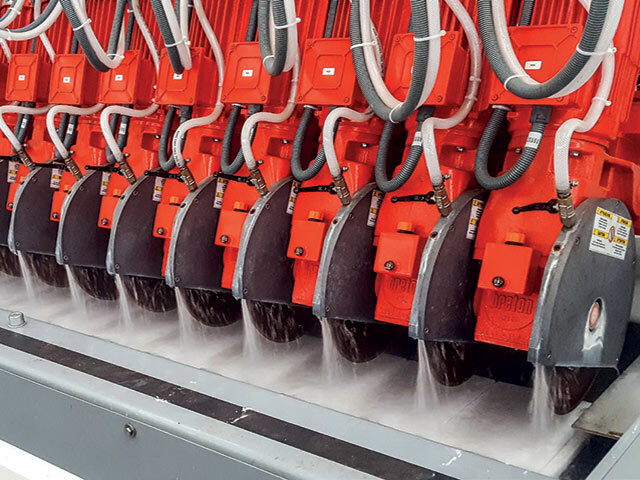 The desired cutting size and blade thickness are entered on the “touch-screen” monitor and each spindle automatically reaches the programmed position. Both the PC and the “touch-screen” monitor are components readily available on the market so as to guarantee, in case of failure, a prompt assistance and spareparts availability throughout the world. In order to facilitate some operations to be carried out within the working area (i.e. blade replacement, maintenance, positioning etc. ), the machine is supplied with a small portable push-button panel that enables the operator to safely control the movements of the spindles inside the machine working area. 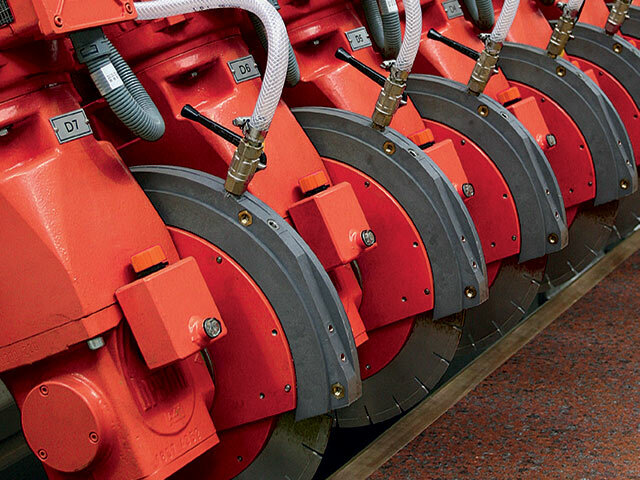 The electrical equipment and water distribution system to each spindle are located on the reverse side of the machine, thus making the maintenance interventions extremely simple and rapid. 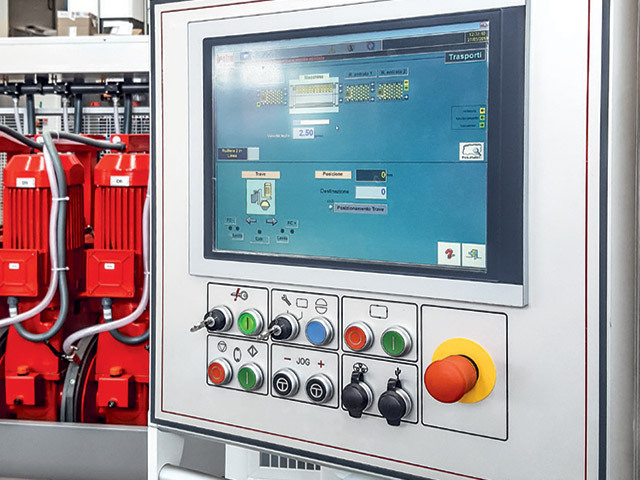 A watertight cabinet houses all the electrical and electronic controls of the machine. Upon request, the machine is equipped with a laser unit which enables to mark off the useful cutting surface through the optical tracing on the strip surface, thus excluding the surface defects. The laser tracer is manually pushed by the operator along the roller conveyor on which the strip is placed, and the demarcation of the useful cutting area is set by simply pressing the proper button. According to both the orders entered in the system and the surfaces marked off by the tracer, the machine automatically decides where cuts must be carried out, and offl oads the “executed” orders. 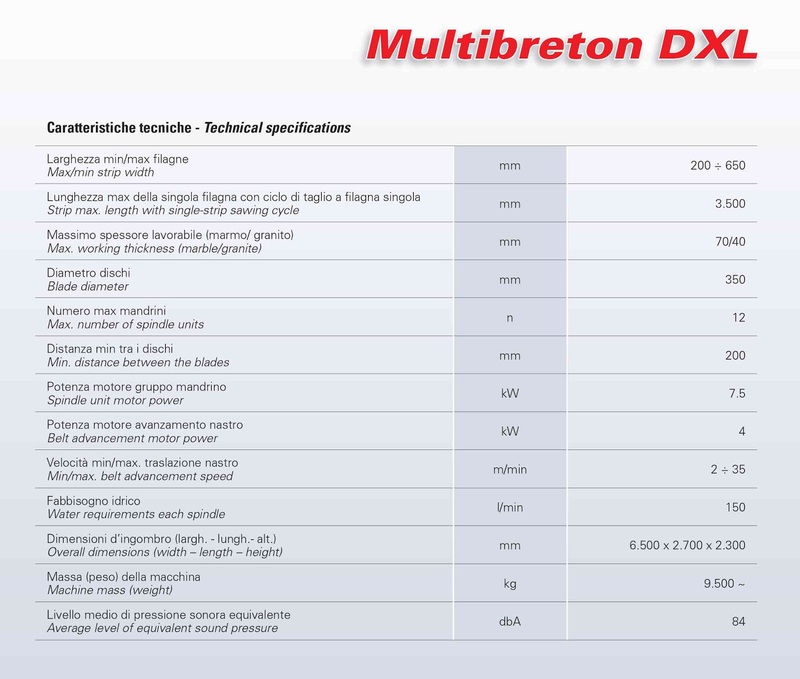 For more information and prices, on the Multibreton DXL, contact mail@breton.it.